Today’s poster is from Leonardo Uieda. 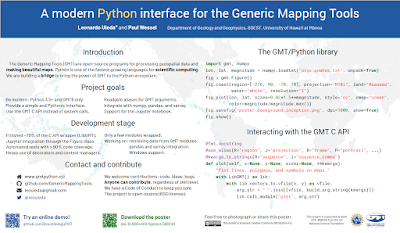 This was presented at the American Geophysical Union fall meeting last year. Click to enlarge! It’s about a software project I’m working on and not really about research results. That’s why it has no results figures (though the background of the poster was generated by the first code block on the right, so it serves as a kind of result). I expect that my main talking points during the presentation will be around the code. Each line was put there so that it would represent an idea in our design and why we think it’s a good choice. The online demo and websites have a lot more information for people to read. Colour coding the text in the code block is another nice touch that adds to the visual interest of the poster. I have no idea if the colour highlight consistent elements of the code, but that would be the principle to look for. After printing, I realized that I should have made the margins wider, particularly between the two halves of the poster. I agree with Leonardo that a bit more white space between the halves would be a good idea. But luckily, the text on the two sides only approach each other at about two points, so this is not a horrible problem. There are two QR codes. Leonardo is good enough to give brief descriptions of what they are, which is excellent. I might want a little more detail about what the demo consists of, though. Can I run it on my phone? Is it interactive? Is it a video? This poster shows a lot of good decisions. 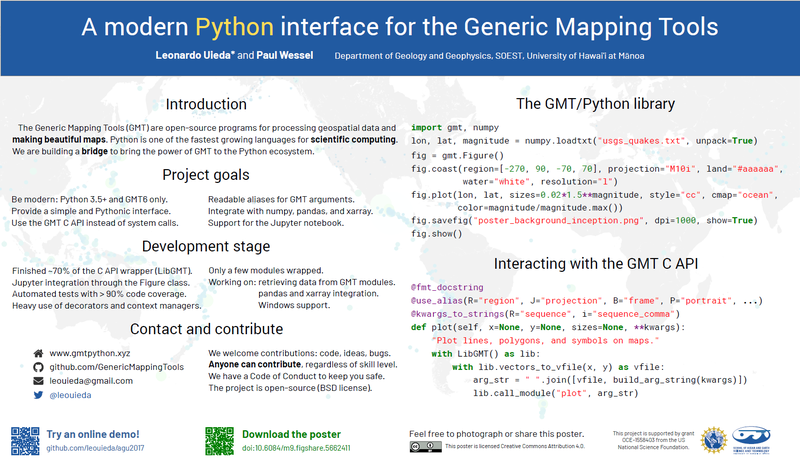 I just wonder if there are enough people browsing during the conference who would recognize and care about “Python” or “Generic Mapping Tools” to come and chat. Web design services has gained popularity in the last few decades, since the internet has become accessible to the common people.A web design company providing web design services that not only concentrates in building a remarkable and inspiring user-friendly website, but also undertakes the mission of endorsing it on the World Wide Web successfully.